The Great Apartment Paris - all the details! Still doing the rounds of the banks (a helluva lot of fun, as you might imagine). In the meantime, we went back to the apartment, took some measurements and made a little film to show the interior decorators. Here's the film. Music by the wonderful Notwist (buy the album here). super mignon! Je suis curieuse de voir le resultat! L'enorme armoire dans la cuisine va surement voltiger!? We're here! 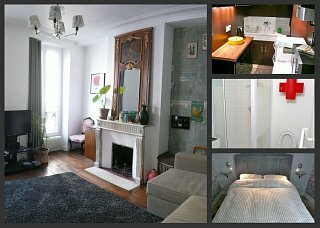 Right in the heart of Paris, 2 minutes from the Pompidou Centre! See the Great Apartment in Paris on a bigger map here. So what's this site all about? We've completely renovated a sweet studio apartment just next to the Pompidou Centre, with designer furnishings, surround sound DVD system, wi-fi internet access... and it can be your base in Paris for a few days or a couple of weeks! This site tells you how it came to be, gives the latest news and allows you to book securely online. Hope we'll be able to welcome you soon to the Great Apartment in Paris! And we have another apartment to rent too if you're interested! Is the Great Apartment already booked for your dates? Need somewhere for more than two people? We've renovated and redecorated a second apartment in a cool area of Paris by the canal. We've called it "the Canal Apartment". Because we're geniuses. Check out our other fab apartment here!